The Dodge Durango is a popular spot-holder for many driveways in America as a family SUV. It’s hitting plenty of high notes with its passenger, cargo, and towing capabilities, and it’s all tucked in a smaller package than other SUVs out there. Plus, the choice of five trims offer drivers a little variety without sacrificing too much between one or the other. Engine options have also hit a high mark for towing power and fuel economy. Between the five trims on the 2016 Dodge Durango, there are only two engine options. All trims but the Durango R/T have a 3.6-liter V6 24-valve VVT engine with ESS. VVT engines use “variable valve technology”, a process designed to optimize an engine’s performance without sacrificing fuel economy. To further this development, the engine comes with an “electronic stop system,” which turns off the engine when idle, and then starts it back up once the brake pedal is released. The fuel economy on the highway is best-in-class with 27 mpg. The other engine option is a 5.7-liter V8 HEMI MDS VVT engine, and it is only available on the R/T trim. Why would a family SUV need Road/Track technology? To make the carpooling commute more fun of course! Gotta get those kids to school on time (and out of your hair) right? With a MDS in place, four of the eight cylinders on the V8 are closed at steady speeds to double up on the fuel economy savings. One wouldn’t usually think of towing with a Dodge. Their vehicles are muscle cars and family vans, not SUVs. Well, that goes to show there’s always a surprise. 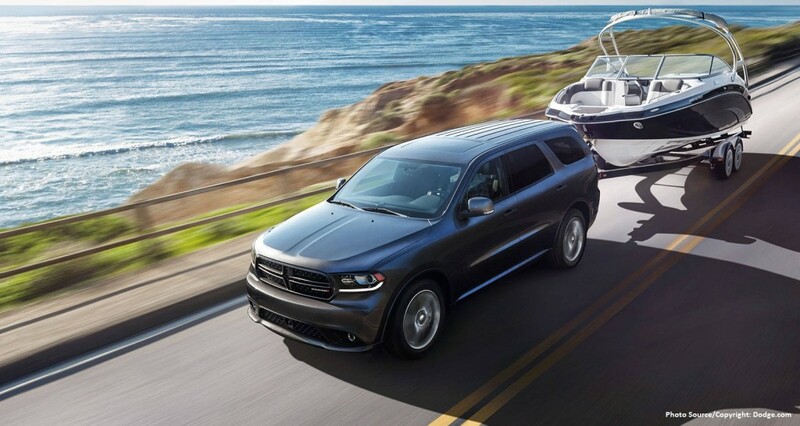 The Dodge Durango has a towing capacity from 3,500 – 6,200 pounds. 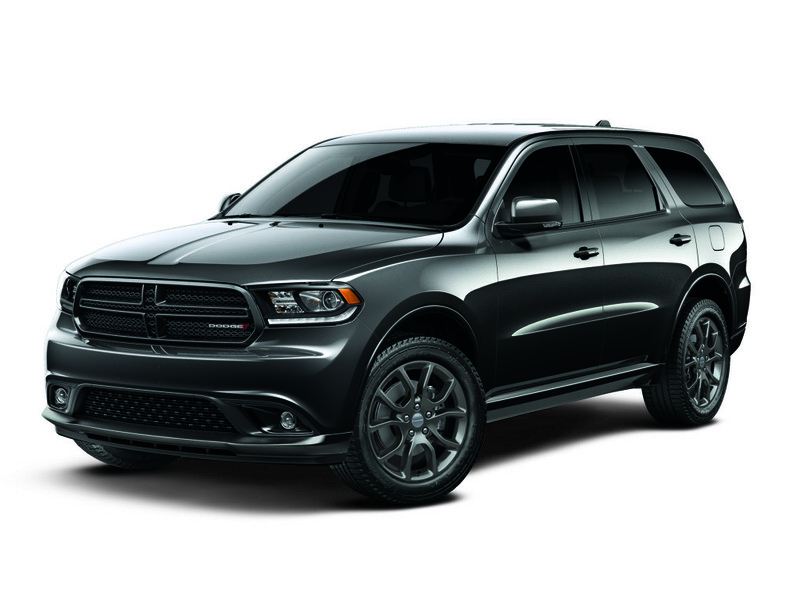 With the power of the Durango R/T’s V8 engine, that number jumps up to 7,400 pounds. Sure, the Durango is an SUV at heart, but is it such a stretch to say it’s also a bit of a crossover? Automatic headlamps come standard on all trims, LED tail lamps are also standard, and so is an acoustic windshield and exterior heated mirrors. Already, this SUV is designed for getting the driver through the foggiest of days. On the roof, on all but the SXT base trim and the R/T trim, integrated roof rail crossbars can be installed for extra storage options. Tell us that’s not the type of thing to see on a crossover! The 2016 Dodge Durango rides on either 18-inch or 20-inch wheels. They come in many varieties from polished aluminum to hyper black and satin carbon finish. The tires are all-season (performance) tires. The exterior styling choices give drivers up to nine colors to choose from. Seven passenger seating is capable across all trims, and heated seats in the front and back come standard on the Limited, Citadel, and R/T. It’s an available option in the front for the SXT Plus. The seating trims are cloth, leather, and luxe leather. For different seating arrangements, the second row is a 60/40 fold and tumble seat, but the option of second-row fold/tumble captain chairs is available in all trims but the base. Captain chairs are individual seats for one passenger with arms rests versus a bench seat which could seat up to three. 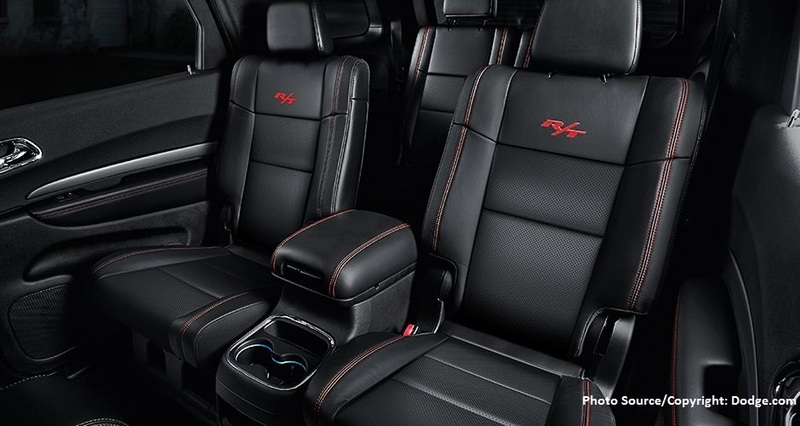 Bits of luxury are sprinkled throughout the cabin of the Dodge Durango, too. There is a three-zone automatic temp control, an auto-dimming rearview mirror with microphone, cargo compartments for extra storage, and an electric vehicle information center. It’s built to make any ride very smooth. In the upper level trims, the steering wheel is heated, and a sunroof is available (standard on Durango Citadel, optional on R/T and SXT Plus trims). Up to three colors are available for interior styling. To start, a 6-speaker audio system is the standard on most trims, but there are nine amplified speakers and a subwoofer for the Durango Citadel. For the R/T, enjoy a Beats premium audio system. 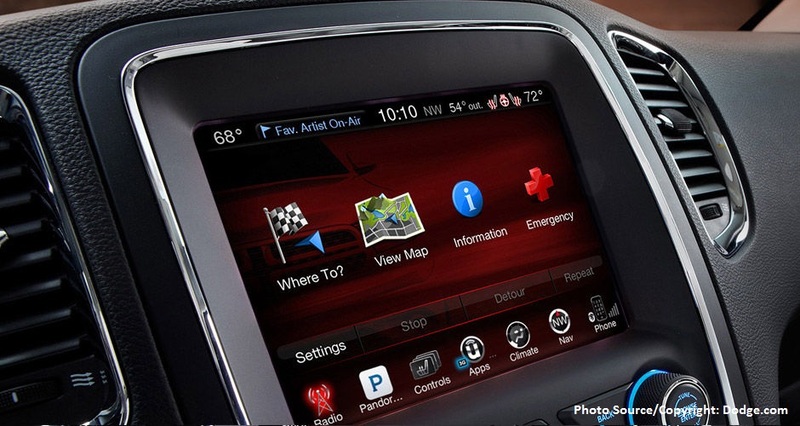 A 5-inch touchscreen is also standard among the SXT and SXT plus, but can be upgraded to an 8.4-inch on the SXT Plus (standard on other trims). All trims come with integrated voice command with Bluetooth. A rear seat video entertainment system is optional on the Durango Limited and R/T trims. Being a FCA brand, Uconnect is of course the go to for Dodge. Uconnect 4.0 AM/FM/BT, Uconnect 8.4, 8.4 Nav, and Uconnect Access are all available across the different trims. All the basics can be found in the Dodge Durango, such as advanced multistage front airbags, supplemental side-curtain airbags, sentry key theft deterrent, hill start assist, keyless go, ready alert braking – you know, all that stuff. Advanced options like ParkSense systems are optional on the SXT Plus, standard on the rest of the trims (not SXT). Blind spot and cross path detection are options for the Limited and R/T. All trims are covered under Dodge’s standard warranties: a 3-year/36,000-mile basic warranty, a 5-year/60,000-mile powertrain warranty, roadside assistance for 5 years or 100,000 miles, and rust-through coverage for 5 years/100,000 miles.